MIRTEC, “The Global Leader in Inspection Technology,” will premier its complete line of 3D AOI and SPI Inspection Systems in Booth #1334 at the 2016 IPC APEX EXPO. The premier technical conference and exhibition for the electronics manufacturing industry will take place March 15-17, 2016 at the Las Vegas Convention Center. The Award Winning MV-6 OMNI 3D AOI Machine is configured with MIRTEC’s exclusive OMNI-VISION® 3D Inspection Technology which combines our 15 Mega Pixel CoaXPress Camera Technology with MIRTEC’s revolutionary Digital Multi-Frequency Quad Moiré 3D system in a newly designed cost effective platform. MIRTEC’s 15 Mega Pixel CoaXPress Vision System is a proprietary camera system designed and manufactured by MIRTEC for use with our complete product range of 3D inspection systems. 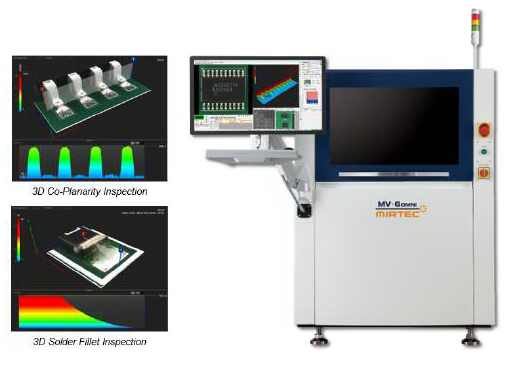 MIRTEC’s Digital Multi-Frequency Quad Moiré Technology, provides true 3D inspection using a total of four (4) Programmable Digital Moiré Projectors to yield precise height measurement data used to detect lifted component and lifted lead defects as well as solder volume post reflow. Fully configured the new MIRTEC MV-6 OMNI machines feature four (4) 10 Mega Pixel Side-View Cameras in addition to the 15 Mega Pixel Top-Down Camera. There is little doubt that this new technology has set the standard by which all other inspection equipment is measured. MIRTEC will have two (2) MV-6 OMNI’s on display one configured with a 10um lens for High-Performance applications and the other with a 15um lens for High-Speed applications.